Have you applied for SSCW Tech 13 course and looking for SSB interview dates? Check out list of shortlisted candidates for SSCW 13 Tech course of Indian Army along with center allotment list and SSB dates. Indian Army has invited applications from talented women engineers of India for its upcoming SSC Women 13 technical course. Candidates who will be selected for this course will become technical officers in Indian Army's technical branch. Many girls who have completed their engineering have applied for the course. Today, Indian Army has published center allotment list of SSCW 13 Tech course. There are total 4612 candidates shortlisted for SSB interviews. 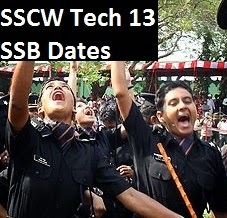 So, Army will publish consolidated SSB dates of SSCW Tech 13 course of Bhopal, Bangalore and Allahabad selection boards. We will update here as soon as we get the news. Indian Army has set 70% percentage as cutt off marks of SSCW Tech 13 course. The marks calcualted for first six semesters only. So women who have filled up the applications correctly and have scored more than 70 percent marks are shortlisted for the SSB interview. SSB interviews will start within 15 to 20 days from today. So go on and prepare for the interview from now onwards. You may consider TES 10+2 entry course, CDS exam I 2014, TGC 119 course and SSC ES/Technical branch course of Navy to apply for.